This That and The Other! My studio is filled with a bit of everything in the process of a makeover. catching up with unfinished items long overdo. Today is a wonderful rainy day. because these are the kinds of days when I love creating. I am in a little of a "this and that mood"
So come along and join me. I'll be on the hunt for pallets that LJ and I can transform. I'll show you what we come up with. In the meantime, visit Shirley and say hello. 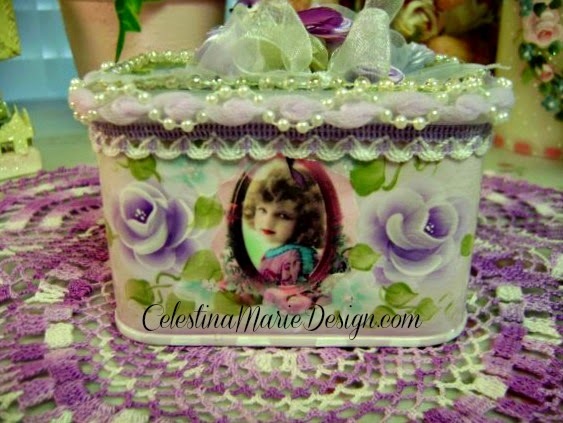 You will love visiting her wonderful blog and her talents for decorating. Thank you Shirley, I am so enjoying this book and the many project ideas. I seem to have met the hustle of the season head on. The color of this one is a light Parisian Gray in my signature design with a shell edge. Well I found the chalk board pens at Micheal's. I really only wanted a white pen but all they had were sets. So I purchased these and so glad it came with two in white. The cost was 11.99 for a set of 4. I found them easy to use. This is what I created to experiment and learn below. To clean, simply wipe off with a wet cloth. Paper towels leave lint and streaks. These chalk pens also work on glass, ceramics and tin. Great and dust free with water clean up. Next, this sweet fellow came for a visit. He was carrying a card with my name on it standing on my art table. I gave him my glasses to read what it said. But wow he was so heavy when I helped him off the table. Santa's gained some weight over the last year!! The old glasses are a little over sized, but he still is cute with them. I just love his plaid suit and neutral presents? Another idea I wanted to share, are for these small cafe international tins. In the past I have designed and painted so many of these I lost count. Friends and family saved them for me and some coffee's I purchased too. idea of those I created years ago. but the designs I created and sold were everything from roses to cherries to french graphics and more. Now the cafe international folks redesigned their tins to plastic. but was questioning how the plastic would take paint. Well, chalk paint of any kind works without priming. but with one less step to the process. Here is one already painted with chalk paint right over the plastic and ready to decorate. You know these are great to create with the kids. You don't have to just use paint either. Cover with pretty papers and trims for a special gift box too. Yes, the studio has been a buzz and I won't even show you the pic of this space. It looks like a Texas Storm has come through with high winds. But hey, you have to make a mess to "Getter Done" right? to this large barn filled with treasures just waiting for new homes. Inside I found some great goodies for the shop. This is what I decided to keep. The gorgeous old harvest barn plate and the green toile cup and saucer. Both pieces wanted to stay with me and my pumpkin teapot. It's been a great few weeks of "this and that"
but I am taking the time to enjoy the beautiful season too. Like this trip to Roundtop, Texas in October. Love the sweet church in the background. This little village has some of the best shops. Well, that's all of my "this that and the other" for the moment. Welcome to all new followers too. Good Morning, Celeste. Your throw is gorgeous. Thanks for sharing about the chalk pens, also. Your café boxes are very sweet. I have a friend who owns a consignment shop and she and her husband make a lot of furniture/shelves etc. with pallets. I will have to share with her about your book. Your crocheted blanket is so very beautiful!! I just adore the coffee boxes you decorated too... they look fabulous :) The sunset photo looks amazing! I like to start most days watching the sun rise as I walk along the beach. But watching a sunset like the one pictured would be the perfect way to end a long day! Celeste! You are so talented! I love your cafe boxes and you made that beautiful throw! It is gorgeous! Some beautiful photos here too! I hope you enjoy your rainy day. Hugs! Celeste, only you could make a coffee container look fabulous! You are so talented! I also love your chalkboard and appreciate the tip about using a soft cloth to remove the chalk pen! The crocheted lace throw is stunning- what a treasure! I adore your barn plate too! Have a wonderful week! Celestina...thanks for the wonderful "shout out" Glad that you won the book and enjoying it...looking forward to your future pallet project....the crocheted throw is magnificent...I just wish I was patient enough to sit still when my mother was trying to teach me how to knit and crochet...Those coffee tins are certainly a perfect size for embellishing and repurposing!...and don't you just hate it when you only want one item and you have to buy multiples?..Need to try those pens...Have a wonderful day!! What a beautiful post, sharing all of your "this, that and the other" ideas. I love the Santa Claus...especially the plaid. The afghan is beautiful...love the colors in the yarn. Who knew that the coffee tins could be so beautifully redone. I'll be looking to see what you do with the one you just used the chalk pens on. You certainly are talented, Celeste! Wow. Celeste, your painting talentsare impressive...those coffee tins...whag a makeover!!!!! There is so much to love here this morning. I am at school anf must go, but I wanted to come by to peek at your work. Wonderful!! 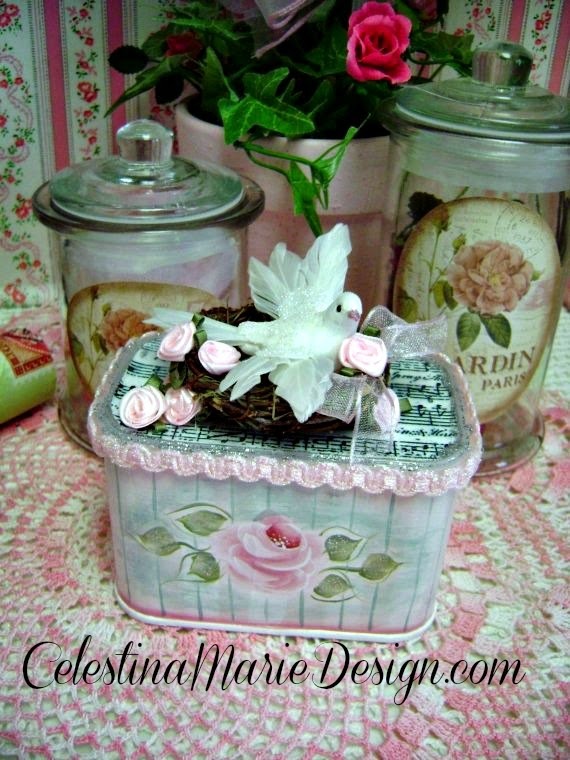 Your tins are so pretty, what a great idea to repurpose something that would otherwise get tossed! Those are my favorite types of projects:) That book looks awesome too, what a fun win. Love that clock!! And I also love the pic of you in Round Top! Looks like a cute town. Oh, and I love the title of your post, too:) Santa is so cute, almost puts me in a holiday sort of mood! PS: love, love, love your gorgeous crocheted afghan! It looks so cozy, and I just love the lacy pattern!! sweet creations! am looking forward to some pallet designs, too! Love all your creations, especially the afghan. Last year I started crocheting again after a 25 year break and it was like I had never stopped. Beautiful sunset. Love your repurposed coffee containers! So pretty! I have never heard of chalkboard pens. They would be an awesome gift for my sisters enormous chalkboard! Great photos! so many beautiful creations! I love those coffee jars and I love this Santa! he is georgeous! Thank you for sharing all your wonderful works and tips... you are so inspiring! Just love your blog and look forward to each post you do! The cozy throw you crocheted is gorgeous and makes me want to grab it and curl up on the sofa with it! I was so disappointed when the Café tins were discontinued and then made from plastic! Ugh! I loved those for not only decorating and giving as gifts but also for storage for small craft supplies! They are making it difficult on all of us who love tins such as these and coffee cans. I have a hard time finding metal coffee cans anymore too...all are plastic! I am looking forward to your post on the wood pallets, I know you will come up with something awesome! great looking book win, celeste:) love your pretty throw, too! beautiful santa-love the glasses on him:) thanks for sharing the pens and tins ideas! I too love a rainy day! All your creativity is delightful, looks like you are a true Santa's workshop with all your artist endeavors. Pretty crochet throw, delicate edge, lovely Celeste. I found on Amazon Prime a 5 pack of chalk fine tip white pens for a very reasonable cost. But they also have all white regular tips too. I needed the fine tip for a little project I'm working on as gifts. Your barn finds are pretty and congrats on your giveaway win. this post is so full of inspiration Celeste! And the rainy day pic--well, that is just about every day here in the Oregon fall and winter! Blessings! I loved seeing all your recent this and that things! The International Coffee container idea is so great. Your painting turns them into little treasure boxes! And that new sign...Compliments of the Season is so adorable! Looks like you hit a great sale at that barn. The items you're keeping look so sweet on your buffet. Thanks so much for stopping by to see Marie's fabulous magazine article! I'm so happy that she was honored to be in it. Keep on creating! I love every single thing you make Celeste!! Hi Celeste. Wow so many pretty things. You are so very talented, my friend. Love the throw. Love the painted coffee tins. Your work is beautiful. Love that throw how gorgeous. So happy when it is raining you feel creative. So many pretty things. Beautiful post! I wish we'd get some of your weather. It's in the high 80's today! Thanks for sharing all the pretty pictures. I used to play with the International coffee tins all the time. One of the first pieces I ever had published with made with some. What fun that was. Hope you're having a wonderful day. You amaze how much you can get done. Lots of this and that. Lovely crocheted throw. You are a whirlwind of energy and inspiration! So many gorgeous creations. You do such a wonderful job with everything you do. I also love that crocheted throw you did. The edge is especially beautiful. Love the throw you made...sp pretty!! I've been crocheting scarves for my Christmas show that is in 3 weeks. My daughter gave me a chalk board and now I need to find me some of those chalkboard pins. I'm finally catching up after my holiday and I can see that you have had a great October. I don't really like rainy days but I agree that it's an opportunity to get things done and I like your rainy photo taken through the window. Your grey throw is exquisite and I have a very similar cushion! Your Father Christmas has such a kind face! What you made with coffee boxes is amazing! They are gorgeous, romantic and very elegant. The pictures are fantastic. Hello sweet Celeste! May I start by saying your throw is incredibly beautiful! The color and pattern are simply perfect, my friend. Blessings, hugs, and love to you! Oh it is beautiful, your crocheted blanket, dear Celestina Marie. Congratulations of winning the book, it is wonderful with new ideas. Santa visited you early, :-) but he looks so sweet and beautiful, and yout coffee boxes are lovely altered and noone would ever thing it had contained coffee !! Also congratulations in finding those beautiful pieces on your trip ! I wonder what you are all up to creating here in November and can`t wait to see my friend !! Oh I like your art ideas for Christmas. Your artsy throw overs are really lovely and your pillows. And your tips of Christmas. The ice-cream containers so sweet. The chalk tips. I love doing art myself. I cant believe all that you create. Those tins are stunning - I would have never thought to do that with them. Have a wonderful creative weekend. Well here goes again. I guess the one before this didn't get posted. The throw is beautiful and i Love the color and scalloped edges. I love what you did to the coffee tins. They are very lovely. I would never have thought to do that. You are so talented and come up with so many terrific ideas. I also love a rainy day, not that we get many of them and then it rains at night. Have a wonderful productive weekend.